Yesterday I was trying to keep calm and carry on knitting. I decided to make some changes to my Year of Projects list, and I am really pleased I did. Goodpurlgonebad managed to sum it up in just one sentence, she said: "I agree too that changing one's mind is generally a good thing and the range of projects will mean that you'll always have something that appeals to cast on." After writing that post I dived straight for my Yarn Box and pulled out a skein of Peter Pan DK by Wendy that I was given a few months ago by my Nan (come back on Saturday to see my yarn I've procured over the past couple of months, and what I plan to do with it). It's lovely and sparkly, and just the right shade of purple for my gorgeous niece, Daisy. 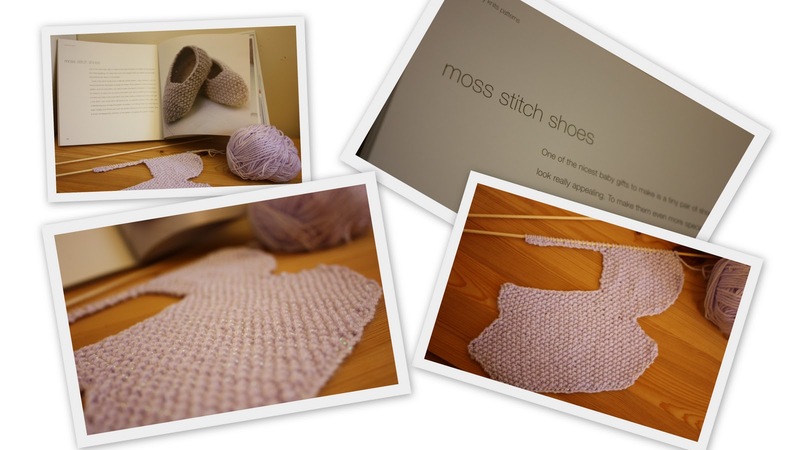 I'm knitting Moss Stitch Shoes by Debbie Bliss, the pattern is from the book Baby Knits for Beginners, by Debbie Bliss. I am planning on making the Jacket with Moss Stitch Bands in the same yarn as the booties, as soon as I can. The yarn is nice to work with, very soft and it just glides across the needles. I had to unravel it once or twice due to increasing the wrong way, and it the yarn became very fuzzy, and the sparkly thread ( I think it is) came away from the yarn and kept getting in the way when I was knitting. But other than that, the yarn has been good. I will definitely use it again, and good job really as I have another 5 skeins in purple, and 6 skeins of white! The pattern is pretty simple to do, had a bit of trouble of increasing 'in pattern' but after a couple of tries I've got the hang of it now. I was meant to use 2.75mm needles for the booties, but as our dear Daisy is growing very fast (as baby's seem to do) by the time I'm finished with these and the cardi (hopefully give them at the same time) she'll be able to wear the pair I am making with 3.5mm needles. Unfortunately it lacks in instructions for sewing up the shoe, so I am going to beg for help from my Mum and all you lovely Ravelers. Hopefully on Sunday you'll find something that slightly resembles a shoe! Well, thats all for now. I'm going to try and get my TV Aerial working as I wait for Super Mario Galaxy to arrive. Woohoo! For more crafty posts, head over to Tami's WIP Wednesday! Looking good so far! Though Im afraid I can't help much with the sewing up as I don't know the pattern, but I would suggest googling mattress stitch and using that, as it's very easy to do.